Emily, 11, visits the PICU room where she spent 5 weeks last summer, most of it in a medically-induced coma. Shown with her (L-R) are her night nurse Danielle Standohar, her mom, her stepfather, her brother, and Dr. Michael Forbes. Almost a year to the date of her daughter’s hospitalization and struggle to survive a life-threatening case of encephalitis, Gretchen Naumoff is planning a joyous 5K race to celebrate life and thank the caregivers in Akron Children’s Hospital’s pediatric intensive care unit. 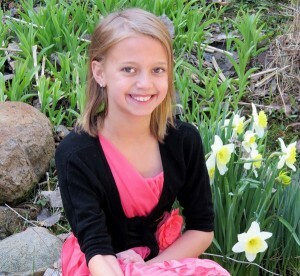 Emily’s Sparkle Sprint, in honor of 11-year-old Emily Kungli, will take place at 9 a.m. Sept. 21 in downtown Akron. The 5K race will begin at Lock 3 Park and continue on the Towpath Trail. A spinal tap confirmed the diagnosis of encephalitis, a rare brain inflammation caused by a virus. 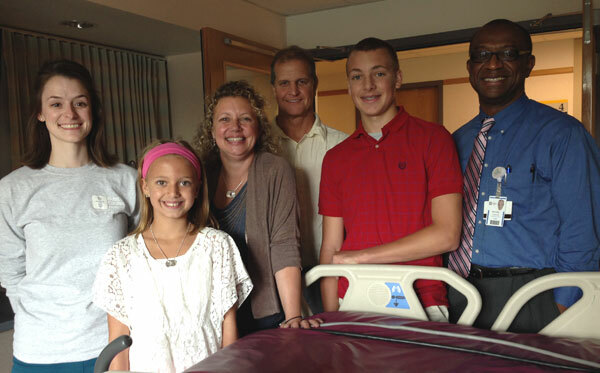 Emily was admitted to Akron Children’s PICU and seemed to respond well to treatment. She went home after a week. Emily’s mom is planning a joyful 5K race to celebrate her daughter’s recovery and to thank Akron Children’s PICU staff. Critical care physician Michael Forbes said Akron Children’s PICU typically treats about 5 to 8 children each year with encephalitis caused by mosquito bites. Emily’s case was one of the most serious he has ever seen. One day, after 3 weeks into the medically-induced coma, Emily’s eyes responded when Jack, a dog in Akron Children’s Doggie Brigade, licked her feet. Then, she pulled out her feeding tube – a purposeful act and a good sign. Soon, talking, eating and first steps were celebrated. Today, Emily is working to gain weight – she lost 18 pounds while in the hospital – but is otherwise back to her original self. She has resumed gymnastics, loves hanging out with friends, and will be starting 6th grade in the Revere Schools in the fall. Meanwhile, Gretchen vowed to stay in touch with the PICU staff and never lose her gratitude. Emily Kungli is doing wonderful nearly a year after becoming critically ill with encephalitis. Since Emily left the hospital, Gretchen has coordinated an effort to make and donate more than 250 blankets for other critically-ill patients. Then she had the idea for an annual race to raise funds for the unit. Funds raised will support staff education, research opportunities and a yearly retreat for the PICU medical team. The 5K is $35 for adults, $12 for children and includes a t-shirt and refreshments at the finish line. Prizes will be awarded to the top-finishing man, woman, child and the racer displaying the most sparkle. Strollers are welcome.